We’re back at it again, folks, with more reviews of the multitude of spooky attractions in Southern California this year. 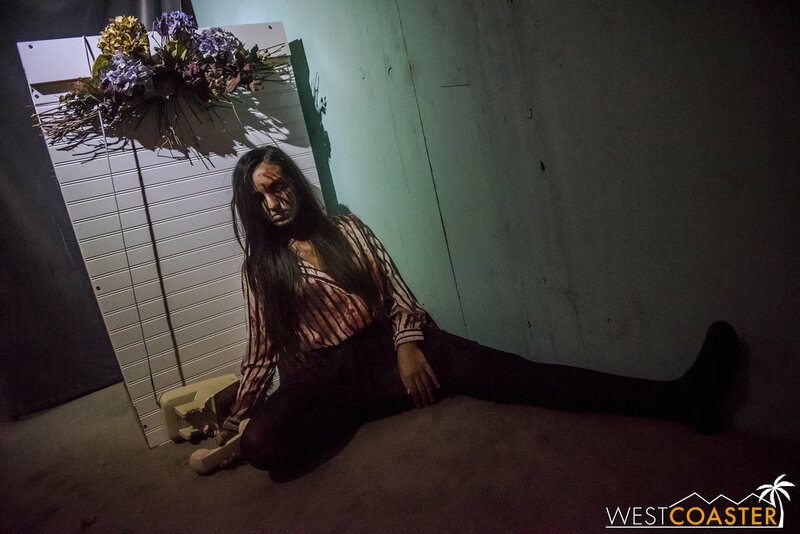 Today, our creeps take us to south Orange County, where a familiar name has resurrected itself with a massive, multi-story and multi-faceted haunt that promises plenty of frights! 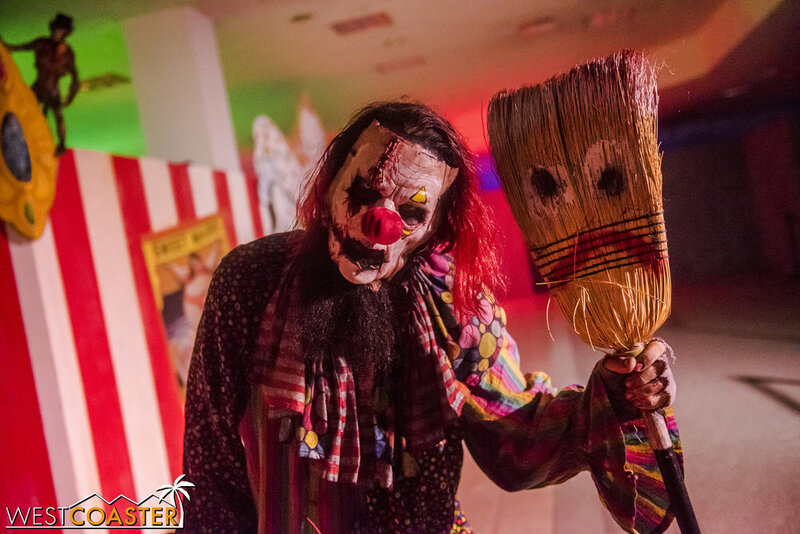 Branded Sinister Pointe’s Scary Place and set in the old Macy’s anchor on the northwest side of the Laguna Woods Mall, this 3-story, 150,000 square foot space features two mazes, a haunted dark ride, a spooky marketplace, and live entertainment. It’s an impressive and ambitious endeavor promising an overwhelming amount of spooky immersion, but did it come through with its promise? Read on to find out. For those unfamiliar with the area, Sinister Pointe’s Scary Place is located right off El Toro Road, a stone’s throw from the I-5 freeway, just south of the Irvine Spectrum. Guests will know they’ve arrived because of the massive poster draped off the side of the building, with a particularly evil-looking clown eying guests malevolently. This graphic was enough to ruffle a lot of feathers in conservative, elderly community-filled Laguna Woods, but fortunately, it wasn’t enough to successfully prevent Scary Place from opening. Look for this when stopping by. 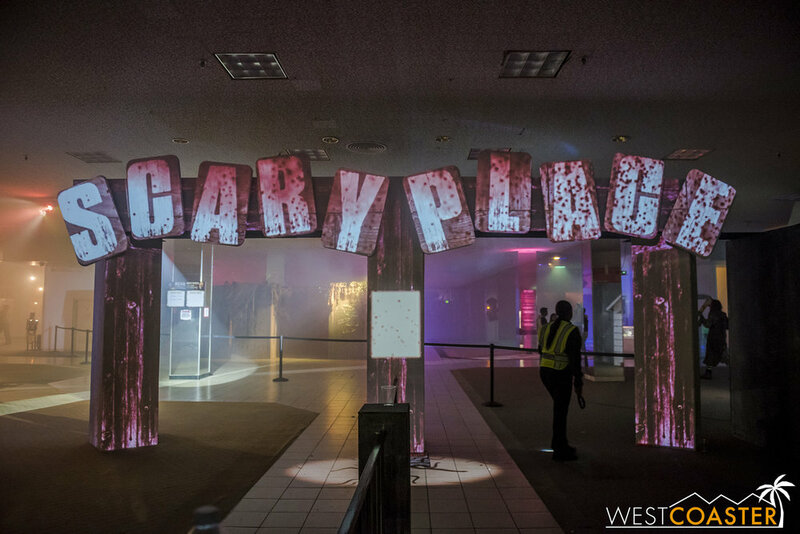 Guests enter off the old primary Macy’s storefront, immediately plunging into an indoor carnival of delightful terrors. Some cool projection mapping over an entry archway proclaims the name of this sinister center—in case you really weren’t sure from all the signage outside—and after a brief security check, it’s off to explore this massive, sprawling Scary Place. 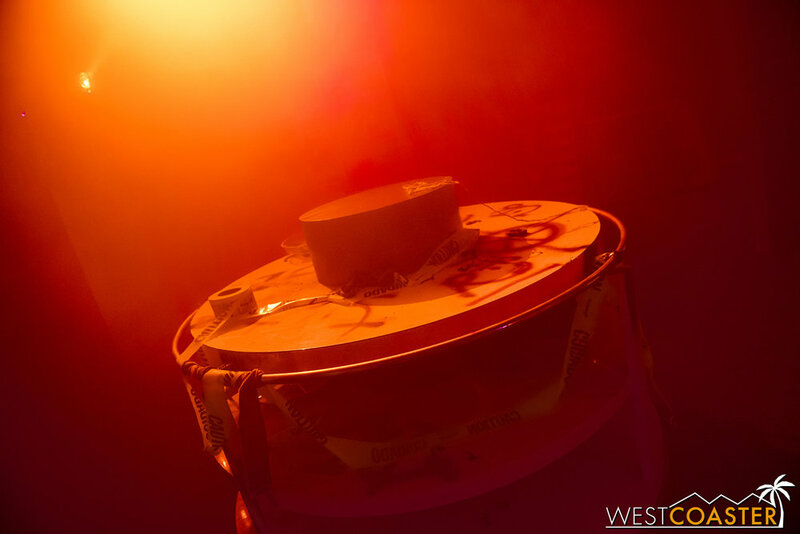 The first floor features two scare zones—one themed to clowns, and the other set to an industrial wasteland—plus a stage where magician Mudd the Magnificent and mash-up musician Monte Revolta and His Band of the Living Dead perform regularly. The left half is primarily devoted to vendors and exhibitors, while the right side comprises the Phobias maze and queue to the Evil on 2 maze. Outside, guests can find food trucks and restrooms. 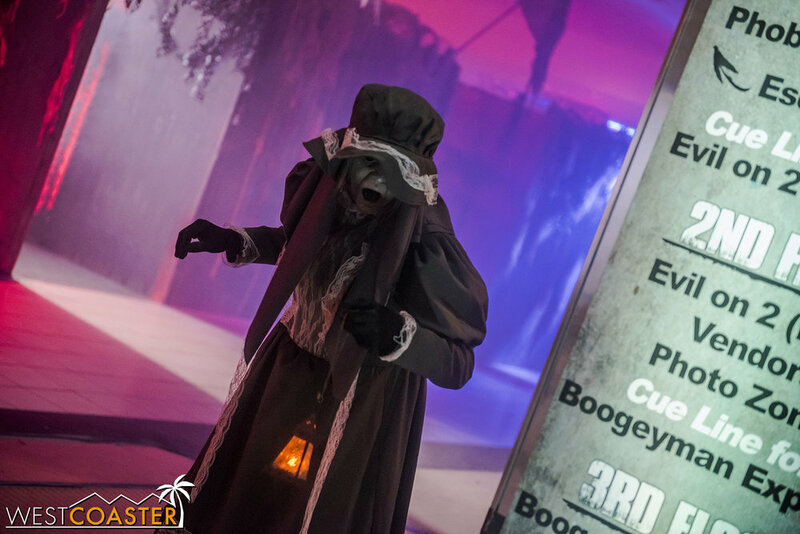 Upstairs on level 2, guests can find the actual footprint of Evil on 2, plus more of the spooky marketplace and the queue for the Boogeyman Express dark ride. By the time guests reach the third floor, it’s time to ride the Boogeyman Express. 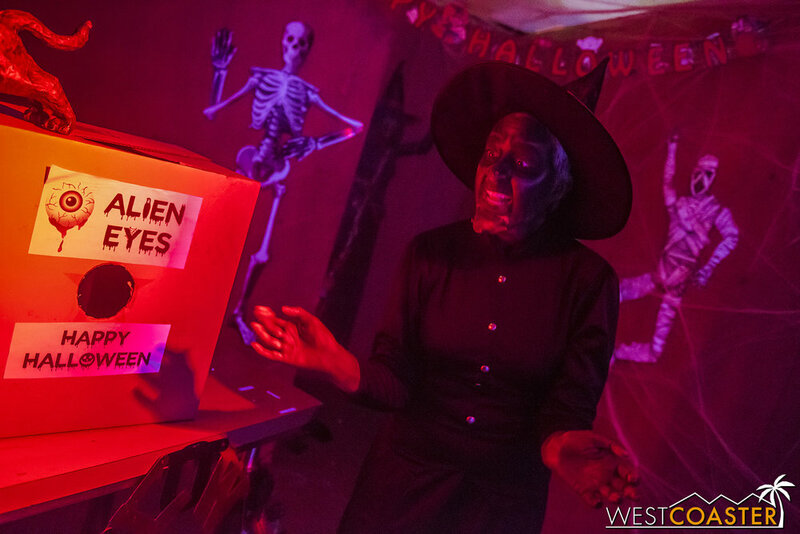 Yes, this haunted wagon ride occupies the entire third floor, offering an extensive experience for guests. 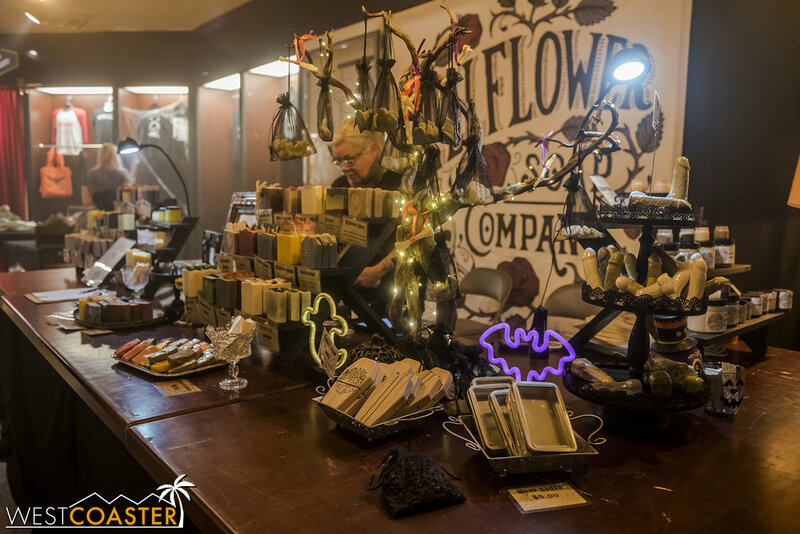 There are a variety of vendors and booths at Sinister Pointe. It’s like a miniature version of the Midsummer Scream expo hall. Mudd the Magnificent offers magical entertainment a couple times a night. 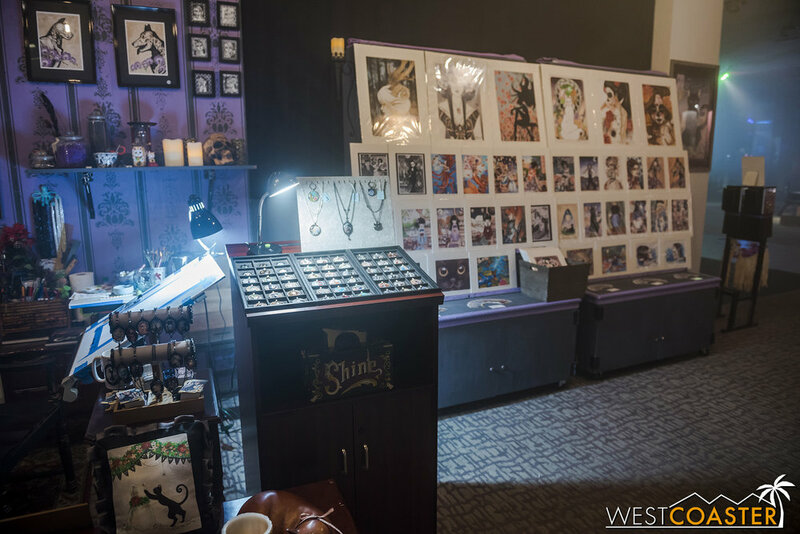 The concept of an all-in-one expo and haunt is pretty monumental, and as executed, presents some successes and some issues. The sheer scale of this endeavor is quite impressive, but we couldn’t help feel that the marketplace area felt a little empty, because of how spread apart the various booths and attractions were. Granted, some of this may be attributed to our Thursday night visit, which is a light evening even for the most successful and busy of haunts. But while the talent and monsters we did encounter were entertaining, the general marketplace area still felt a little bit lacking. We almost would have preferred to see a more compressed space that could better accommodate the limited monsters on on hand, to help buffer up the energy a little more. There are two main scare zones—one themed to clowns. …the other featuring a sort of post-apocalyptic wasteland. 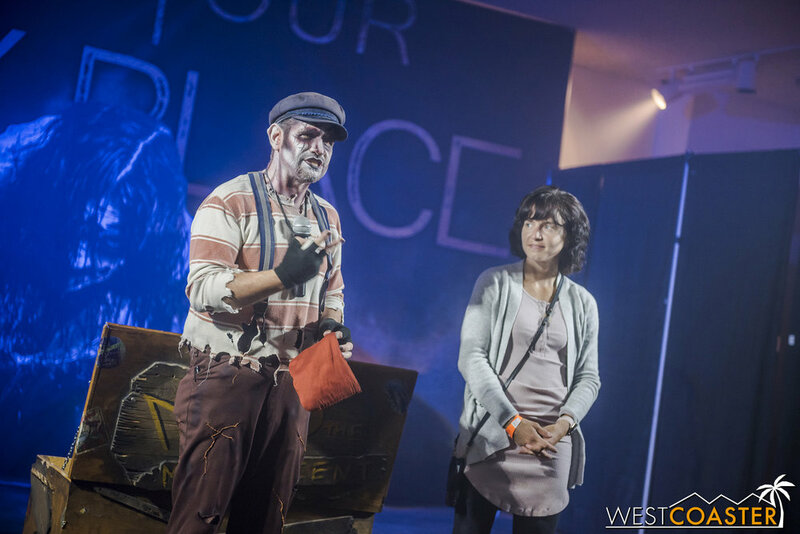 Of the three haunted attractions featured at Sinister Pointe’s Scary Place, the most popular (at least by wait time) is the Boogeyman Express. We recommend that all guests go to the second floor immediately upon arriving to secure a reservation time for the queue. Sinister Pointe has done their best to space out return times (similar to how Disneyland’s FastPass works), but inevitably, the waits do stack up, and even after returning later at the designated time, guests are still likely to queue up an additional amount of time before finally ascending to the third floor for the actual attraction. At the very least, however, reserving a return time allows guests the opportunity to check out the other two mazes. The ride itself brims with a silly and frightful sense of fun—one that clearly doesn’t take itself that seriously. Consider the Boogeyman Express a mixture of The Jungle Cruise and a haunted hayride (sans hay; guests are simply pulled in a little wagon that fits 5 or 6 people by one of those janitorial carts). A host snarkily spiels about the mysterious hauntings and legends that the Boogeyman and his evil minions have taken up residence here, roaming the grounds hunting innocent bystanders! Of course, the natural bright idea is to go investigate and see if these rumors are actually true! Our guide, warning us of the dangers we may be facing. The Boogeyman is not an actual tracked dark ride, per say—the vehicles can navigate freely if they so choose. But the attraction runs on a specific layout, passing various sets and scenes where monsters lurk in the shadows. 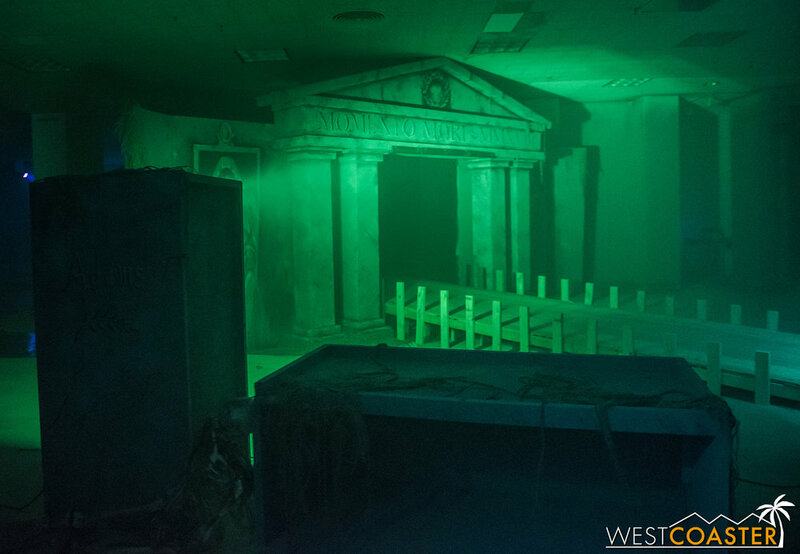 The tone of the attraction is set immediately by the ride disclaimer before guests board, which indicates possible exposure to “fog, darkness, silliness, stupidity, scary stuff, and potholes.” That sarcastic tone continues throughout the attraction as the guide regales guests in mock drama about all the dark happenings going on, and the ambush scares that pop up. Given the general difficulty with mixing in dark rides with haunted attractions (the scares rely on precise timing, and there are limitations to the intensity that the monsters can use), the approach taken by the Boogeyman Express results in a lot of fun, so that even if the scares aren’t quite effective for veteran haunters immune to such tactics, the experience at least remains entertaining. Rolling into a spooky church scene. At some point, guests pass through a portal and into the domain of the Boogeyman. The biggest negative is the limited capacity of this attraction, resulting in the aforementioned long waits. It also means that guests arriving too late bear the risk of missing this ride entirely. Keep that in mind when visiting. Alternately, get the front-of-line Scream Pass and bypass the regular queue upon returning at the reservation time. Strange and grotesque creatures await. Book your express to see them early! 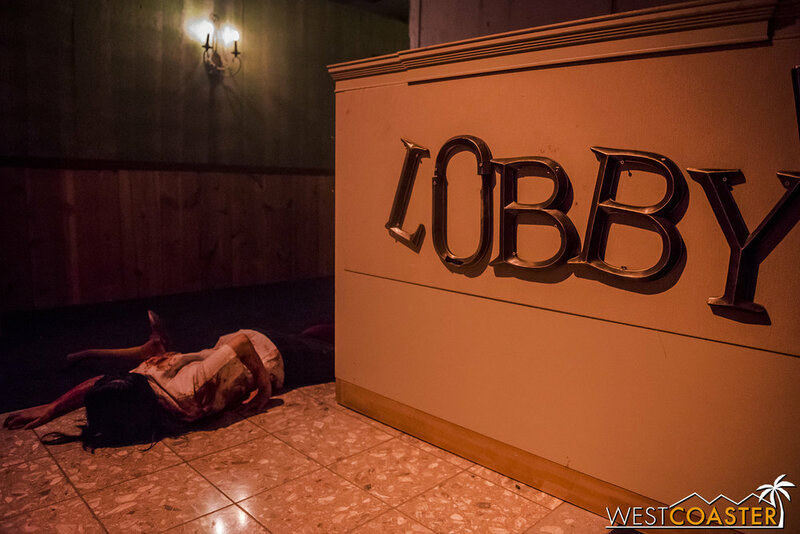 The first attraction we actually did when we arrived last week at Sinister Pointe, Phobias is an investigation into the various psychological fears that surround us. In some ways, it can be thought of as Sinister Pointe’s greatest hit gags, as many of the scenes recall interactive moments in past Sinister Pointe haunted mazes that required guests to complete a certain task or interact with a scareactor in order to proceed. 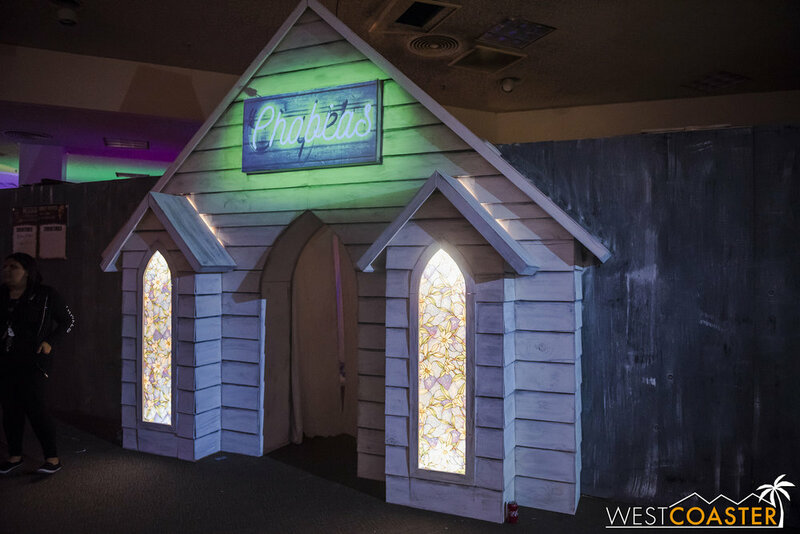 Till death do us part… the first scene inside Phobias. Entertaining the fear of sticking a limb into a mysterious hole. The maze begins, tongue-in-cheek enough, with perhaps one of life’s greatest fears: marriage. An Elvis impersonator marries off two lucky members of the party before sending them on their way. From there, Phobias executes a nice progression of increasingly severe fears. The first room charmingly harkens back to many people’s first haunted house experiences by having guests reach into a box and touch disgusting “brains” or “eyeballs” (spaghetti or grapes). But from there, things start to get a little darker. Clowns? Did someone mention clowns? From clowns to dolls to the dentist to more, Phobias takes guests further and further into their fears. That’s the premise, at least. For myself, having been a veteran of many haunts, the actual scares weren’t really that scary. But for other guests, they seemed to cause enough anxiety. Get your mind out of the gutter. This is a dentist’s office. What deserves high acclaim are the performances of the scareactors in this maze, who throw themselves into their roles with enthusiastic energy and twisted humor. One can tell that these guys are enjoying what they’re doing, because their vibe is infectious. The ironic banter and the psychological manipulation bring both laughter and screams throughout much of the maze. And this is key, because Phobias is definitely more of a performance-driven maze than the average attraction, and it relies on the engagement of the cast to provide a memorable time. Kudos goes out to the talent spread throughout Phobias. Dolls are always creepy. Especially when they come to life. One warning for guests who are sensitive to it… there are two water effects within the maze, towards the end. One of them guests can probably see coming; the other one is a little more of a surprise. But for someone who doesn’t particularly enjoy water effects, this feature was a bit of an annoyance. Finally, we come upon Evil on 2, a maze that takes on the haunted hotel theme. Guests can line up for Evil on 2 to the right of the main performance stage, near the clown scare zone. From there, they are guided by an unnervingly creepy and dramatic host who puts them on a rickety freight elevator up to the second floor. Guests are welcome to the hotel in a less-than-ideal setting. From the start, Evil on 2 was a plus for us. The spiel of the host was sarcastically entertaining, and there was a certain sense of melodrama to the whole setup. Once on the second floor, we progressed through a series of hotel spaces, from a lobby to bar to multiple guest rooms and even a sauna. Immediately, it’s clear that things are not okay, as guests seem to be constantly disappear, while the staff looks rather unhinged. There’s an Overlook Hotel vibe to this, right down to the repetition of some of the increasingly more haunted spaces. Of the two mazes, we felt Evil on 2 presented better and more immersive theming. There are plenty of folks who haunt this hotel. Sinister, evil folk. Here, again, the talent is on point. Though their personalities echo more of the traditional ghouls and monster style, they are constantly in character and committed to their roles. While there’s nothing quite innovative about the scares, the overall execution is solid, giving an enjoyable walkthrough maze experience. I’ve never seen a spooky sauna before, so that’s new! On the other hand, maybe it’s best to just rush through this nightmare fuel. I came out of Scary Place with a bit of a mixed bag of sentiments. While the experience was certainly pleasant and captivating, I couldn’t help but wonder if the ambitious reach might have diluted the quality and energy a little bit. The theming of each of the mazes did not feel quite as in-depth and layered as older Sinister Pointe offerings (their Christmas haunt, for example, will always be one of my favorite haunts ever), and having such spread-out attractions and scream zone scareactors lowered the density of the activity. 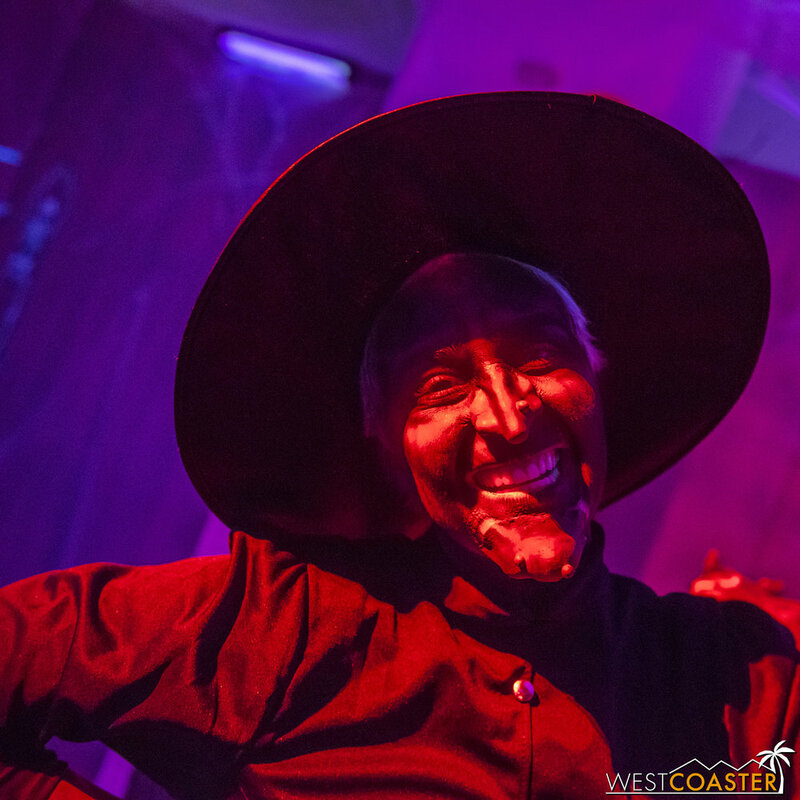 Sophistication-wise, it seems that other haunts have caught up to Sinister Pointe’s formerly-industry-leading innovations, scare tactics, and environments. This is not to detract from the effort put into this event by the Sinister Pointe Team. 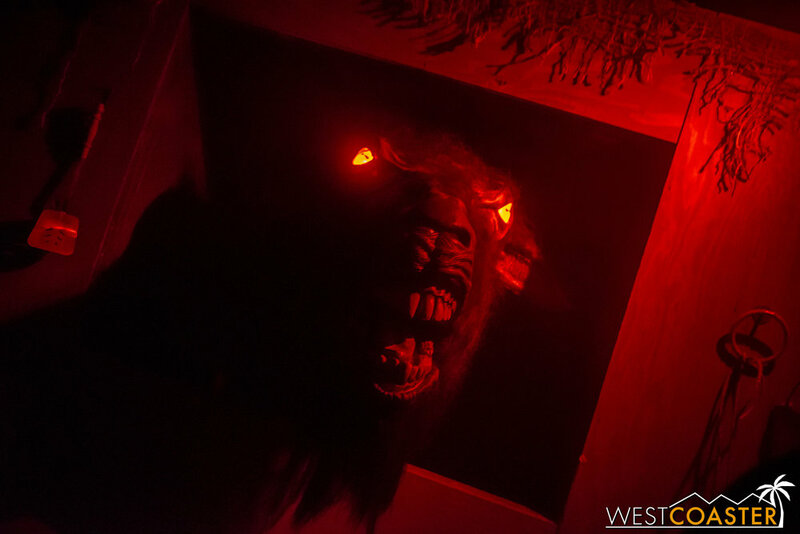 There are so many challenges to setting up and running a haunt—most of them unseen—that could explain the discrepancy between my expectations and actual experience. Ultimately, the takeaway is this: Sinister Pointe’s Scary Place provides a great variety of spooky fun good for a solid half evening’s worth of frights, all for a pretty efficient value (now that they have dropped their prices). There are also coupon codes available for further savings (“SCREAMER2” will net $10 off of regular or VIP admission or $30 off of a 6-pack of tickets). We had a very entertaining time on our visit, and we loved our interactions with the hard-working cast and crew of this epic attraction. And at the end of the day, it’s great to have this legendary fixture in the haunt community back and brewing up frights! 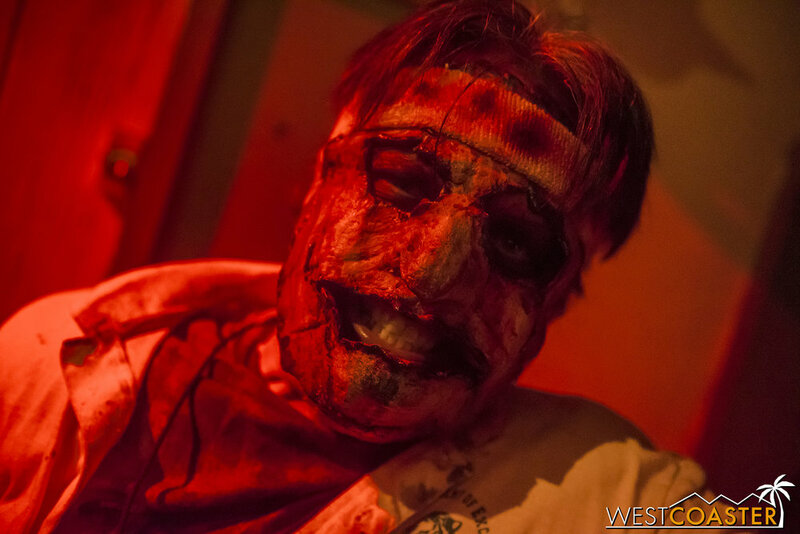 Sinister Pointe runs select nights through Wednesday, October 31st. More information can be found at Sinister Pointe’s web site.